BB-C1 breakout box is designed for SECG 4.0, MECG 2.0 and CMRR 2.0. CMRR tests in particular medical standards can be conducted when using BB-C1 with CMRR 2.0. Easy to connect with patient cable of ECG/EKG DUT. All lead electrodes have the resistance for 51k/47nF, except the electrode of CMRR imbalance with DC is directly connected to the inner shield. CMRR 2.0 with BB-C1 can conduct CMRR tests for ANSI/AAMI EC11, ANSI/AAMI EC13, YY1139, YY1079 and YY0885. 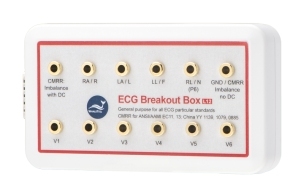 BB-C1 General purpose breakout box for ECG particular standards. Suitable for SECG 4.0, MECG 2.0 and CMRR 2.0.